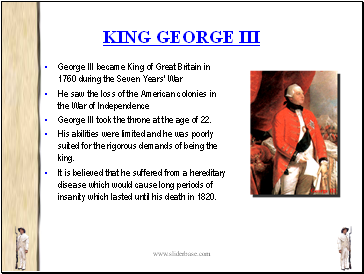 George III took the throne at the age of 22. His abilities were limited and he was poorly suited for the rigorous demands of being the king. It is believed that he suffered from a hereditary disease which would cause long periods of insanity which lasted until his death in 1820. Was the source of much resentment and controversy between England and the American colonists. England's debt was greatly enlarged by the war. 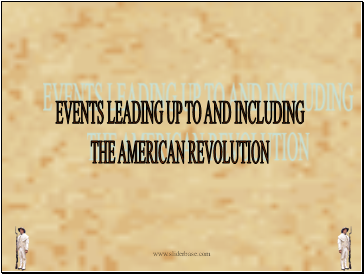 England set plans in motion to gain more control over the American colonists. 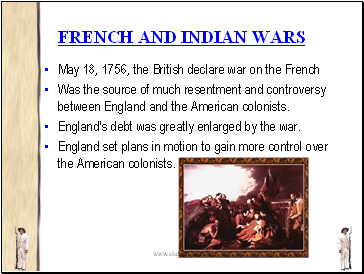 Provided an end to the French and Indian War in 1763. 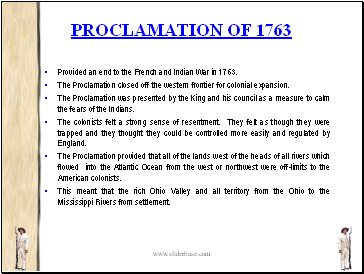 The Proclamation closed off the western frontier for colonial expansion. The Proclamation was presented by the King and his council as a measure to calm the fears of the Indians. The colonists felt a strong sense of resentment. They felt as though they were trapped and they thought they could be controlled more easily and regulated by England. The Proclamation provided that all of the lands west of the heads of all rivers which flowed into the Atlantic Ocean from the west or northwest were off-limits to the American colonists. This meant that the rich Ohio Valley and all territory from the Ohio to the Mississippi Rivers from settlement. 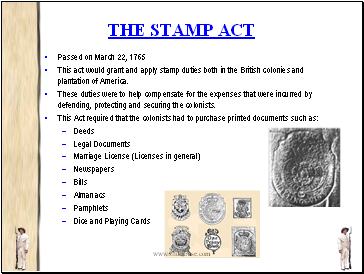 This act would grant and apply stamp duties both in the British colonies and plantation of America. These duties were to help compensate for the expenses that were incurred by defending, protecting and securing the colonists. 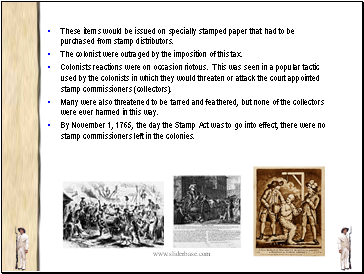 These items would be issued on specially stamped paper that had to be purchased from stamp distributors. The colonist were outraged by the imposition of this tax.